HULSCHER JB, VOSLAMBER B & NIENHUIS J (2016) Mother and daughter Greater Canada Goose Branta canadensis breeding in the same nest in succession: what were the consequences?. 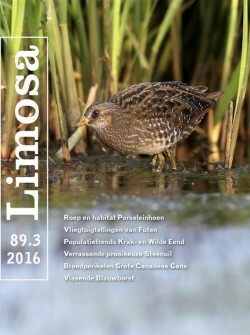 LIMOSA 89 (3): 124-127. A pair of Canada Geese marked with neck collars bred successfully since at least 2010 on a small island in a pond in the village of Haren, the Netherlands. Every year they took their young, at an age of 22-31 days, to a public park about 1 km away where other pairs rear young and nonbreeding Canada Geese moult flight feathers. A daughter of the pair, born in 2011, with her mate established a territory in the vicinity of the breeding island in 2014 and 2015. In both years their breeding attempts were unsuccessful due to disturbance and predation. In 2015 two other daughters appeared in the pond, together with one male. These birds acted as a trio. On 30 April three out of eight eggs hatched in the parent’s nest. The remaining infertile eggs were removed by us. The first daughter had just started a second clutch around 3 May at the edge of the pond. This nest contained two eggs, but was abandoned and she continued laying in the nest of her mother on the island from 6 May onwards. All four eggs in this nest hatched on 4 June. The mother and her partner took their two 31 days old chicks (one died) to the public park on 30 May. A week later they started primary moult. The daughter and her mate walked their 33 days old chicks to the park on 6 July. This was almost a week after they themselves had started moulting primaries, and the first time any parents with chicks made this walk with shed flight feathers. We assume this involved a higher risk for the flightless adults. However the consequences seemed to be more serious for the parental pair, as the daughter pair conquered and bred on the island in 2016, driving their parents and sibling pairs away.